CloudBerry Unlimited supports backup and restore of virtual machines that created and controlled by Hyper-V server. 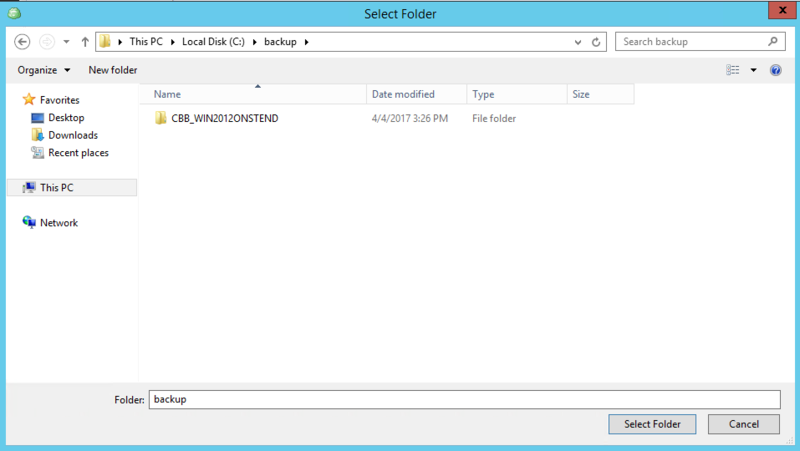 Restore Hyper-V virtual machines is a two-steps procedure where you download the backup files at first and then add the restored machine to your Hyper-V host. Step 3. 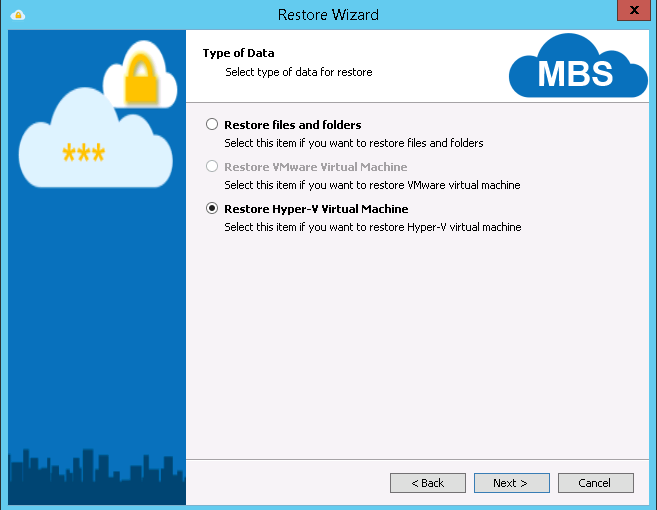 Choose the "Restore Hyper-V Virtual Machine" on the Type of Data step. Step 5. 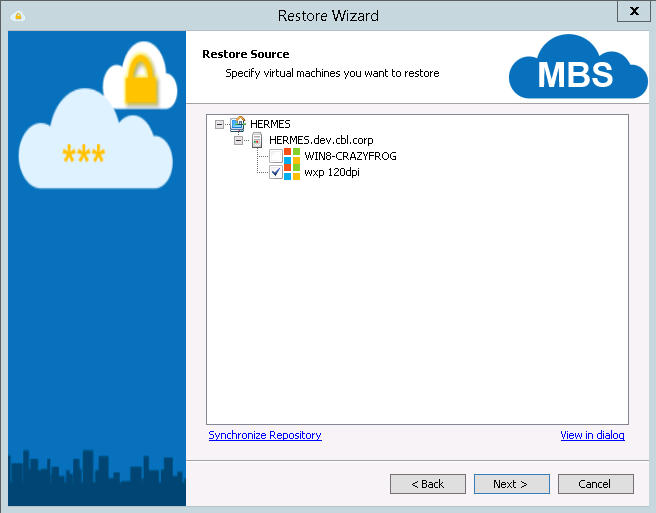 Choose the "Restore Source" to restore selected virtual machines from the list. Step 6. 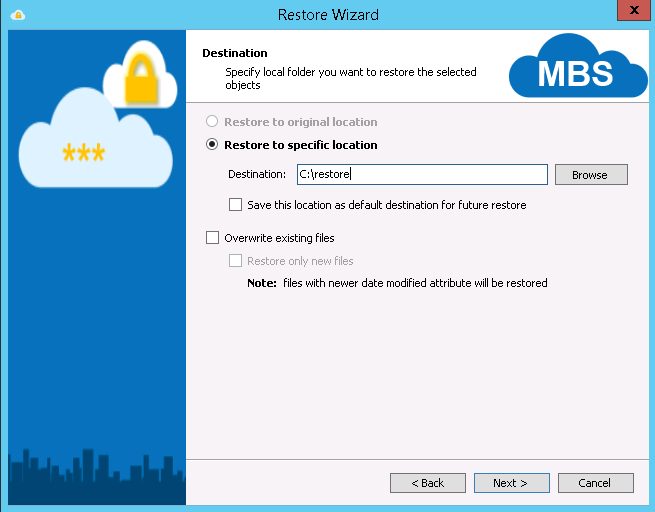 Choose the "Destination" where to restore backup files. Note: original location is not available for Hyper-V restore. Step 7. The "Encryption Options" screen allows you to enter a password if one is needed to decrypt the selected files. Step 8. Specify the Schedule. Here you can set up a custom schedule for restore plan. Step 9. Set up notifications. Step 10. Review a Summary and finish the Restore Wizard. Step 3. In New Virtual Machine Wizard specify virtual hard disk that you restored using Use an existing virtual hard disk on Connect Virtual Hard Disk step. MBS desktop agent 5.6 enables you to perform file-level restore for Hyper-V virtual machines simply by right-clicking on any of those machines in the Backup Storage tab and then clicking File Level Restore.